Heat oven to 350°F (325°F for dark or nonstick pans). Place paper baking cup in each of 24 regular-size muffin cups. Make cake batter as directed on box. Divide batter evenly among muffin cups (two-thirds full). Place ice cream cone upside down on batter in each cup. Bake 16 to 22 minutes or until toothpick inserted in cake comes out clean (cones may tilt on batter). Cool completely, about 30 minutes. Remove paper baking cups. Generously frost cake with frosting, and decorate as desired. Store loosely covered. After frosting, enjoy a downpour! Sprinkle frosted cone cakes with any of the following: breakfast cereal, animal crackers, dried fruit, candy sprinkles, crushed hard candies, graham cracker crumbs, granola, mini chocolate chips or chopped nuts. Vary the flavor of your cake cones by using other varieties of Betty Crocker® cake mix. You could also try different flavors of flat-bottom cones. 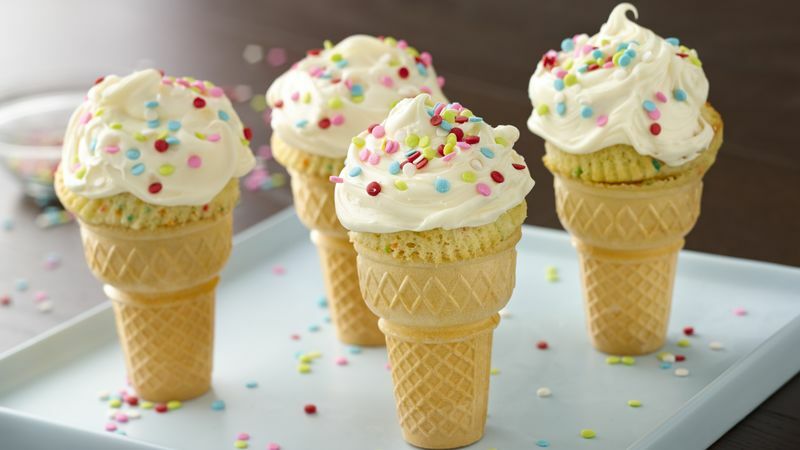 Help steady Ice Cream Cone Cakes on a serving plate by putting a small amount of frosting on the cone bottom; lightly press cone onto plate.